Thanks to Dr. Jordan Roberts, The Methodist Hospital, Texas (USA), for contributing this case. To contribute a Case of the Week, follow the guidelines on our Case of the Week page. (1) Thanks to all who stopped by our booth at USCAP. We posted many photos on our FaceBook page. We also signed up many new authors, and likely members of our Editorial Board. Our website continues to be a free, no registration website focused on the needs of the pathology community. But we have started an optional Membership feature to support the expensive changes we are undertaking, including expanded IT capabilities (new Home Page, new Chapter and topic templates, better Search, improved Mobile use), expanded Editorial Board and more frequent topic updates. 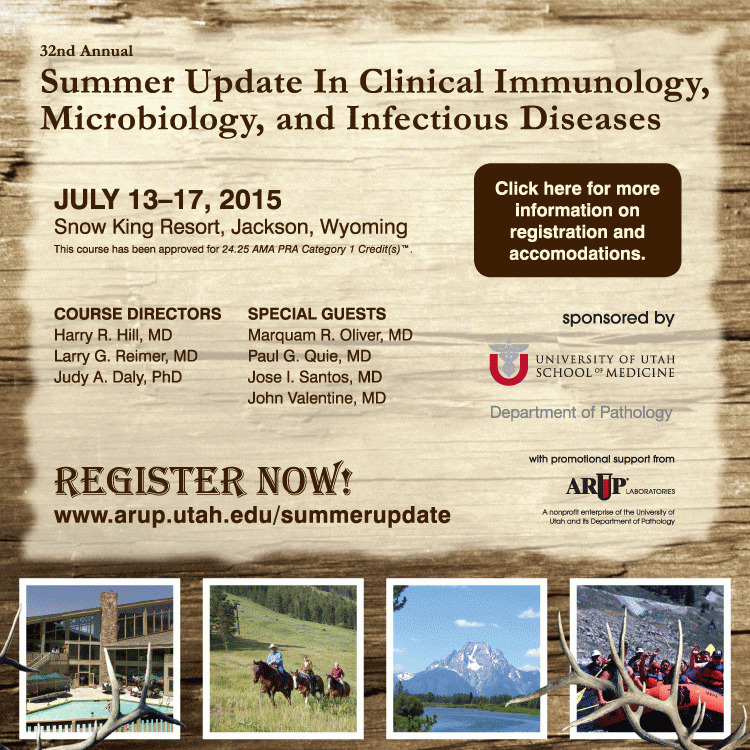 Thanks to new members: Leadership level - Pathology Associates of Norwood, Massachusetts; Basic level - Jorge Billoch, M.D., San Juan, Puerto Rico; Jerad M. Gardner, M.D., University of Arkansas for Medical Sciences; Sara C. Shalin, M.D., Ph.D., University of Arkansas for Medical Sciences; David R. Stockman, M.D., M.S., University of South Carolina School of Medicine; Debra Zynger, M.D., The Ohio State University and Resident / Fellow level - Abul Ala Syed Rifat Mannan M.D., Mount Sinai - St. Luke's Roosevelt Hospital Center, New York. (2) As you may know, PathologyOutlines.com is a participant in the Amazon Services LLC Associates Program, an affiliate advertising program designed to provide a means for sites to earn advertising fees by advertising and linking to Amazon.com. This means we earn a "commission" of 5% or more on items purchased from Amazon, if the visitor accesses Amazon by going through a link from PathologyOutlines.com (the commission is paid from Amazon's profits - not by the purchaser). Read more. (3) The University of Iowa website has changed its access to virtual slides. To view them, you must now download the viewer, see http://www.mbfbioscience.com/iowavirtualslidebox. However, our policy is that we only link to images that can be seen directly by any visitor, without downloading any apps or viewers. (4) Check out our most recently posted article on Business Strategy for Pathology Practices and Independent Laboratories, by Mick Raich, President, Vachette Pathology. For more articles on Management of Pathology Practices, visit our Management page. (5) Visit our Updates page or the Home page, upper right side, to learn what topics have been revised. A 46 year old woman had a stomach mass, which was biopsied. 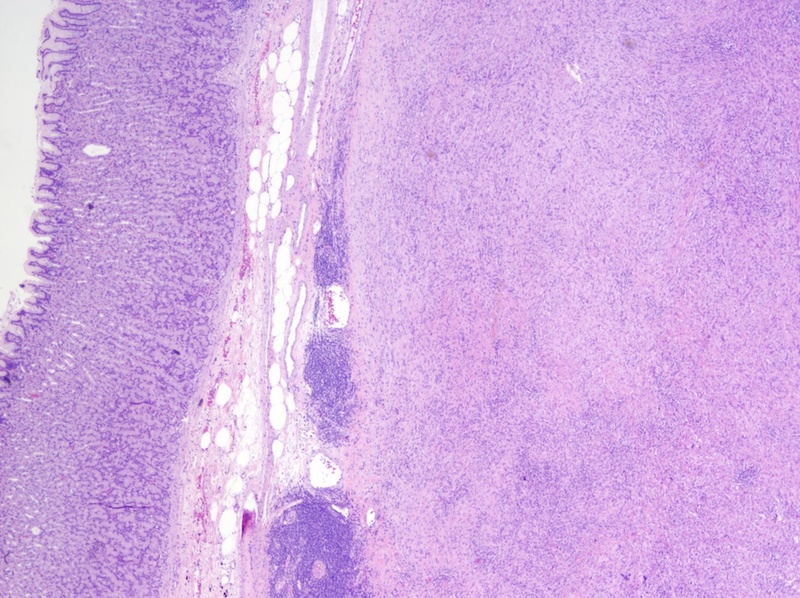 The tumor is well circumscribed and surrounded by lymphocytes with germinal centers. It consists of with interlacing bundles of spindle cells and collagen. 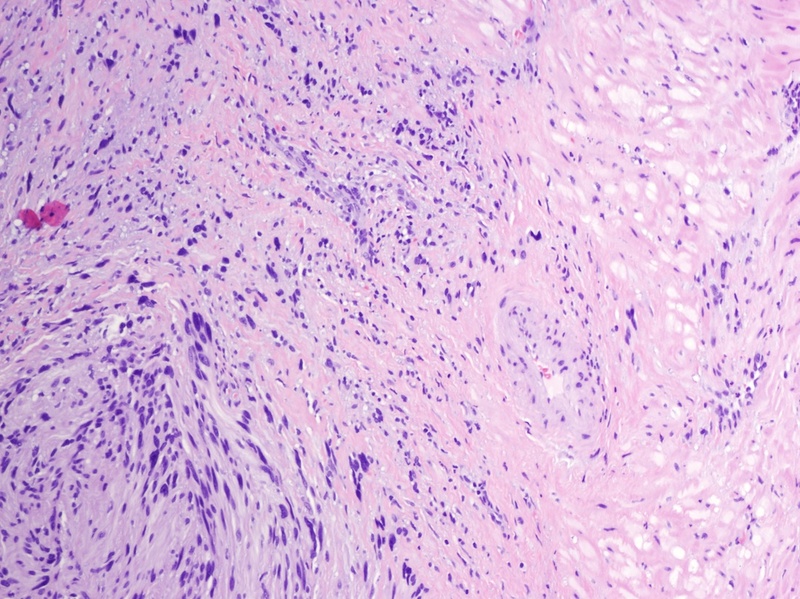 At other sites, Schwannoma is typically biphasic, with compact hypercellular Antoni A areas containing Verocay bodies and myxoid hypocellular Antoni B areas with thickened hyalinized vessels. However, stomach tumors typically are not biphasic and lack Verocay bodies. 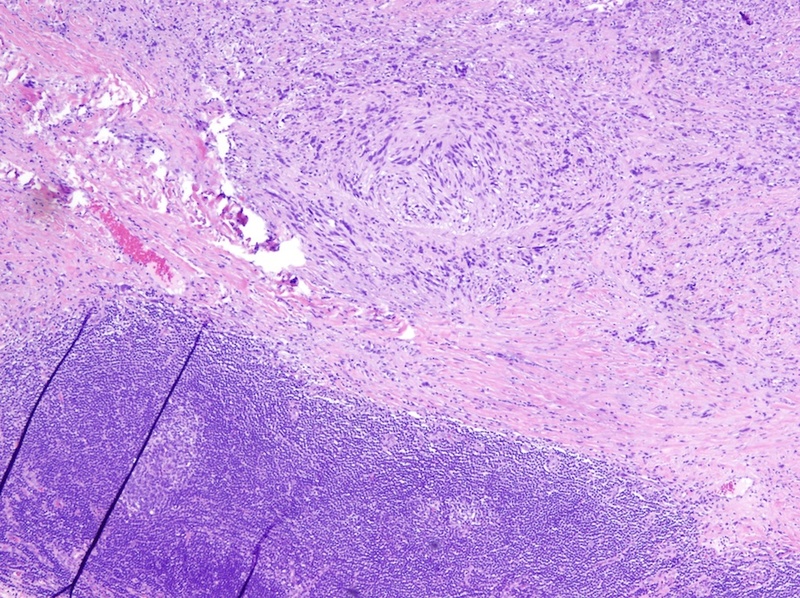 The tumor cells are narrow, elongated and wavy with tapered ends. They may also display degenerative nuclear atypia (ancient change). Schwannoma is rare in the GI tract. It occurs most frequently in the stomach, but still only at 1/50 the incidence of GIST tumors. 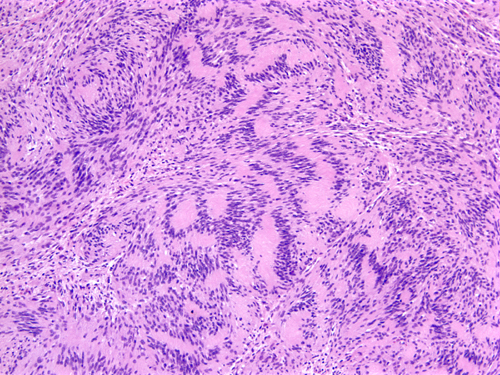 Schwannomas originate from nerves with a Schwann cell sheath. As in this case, they are usually benign, slow growing and asymptomatic, but may cause bleeding, pain or a palpable mass. Immunohistochemistry may be useful, as Schwannomas are positive for S100 and vimentin and negative for cKit / CD117, CD34 and SMA. The differential diagnosis includes GIST tumors, which are CD117+ and CD34+, S100- and vimentin-. Leiomyomas are SMA+ and S100-. Excision is usually curative, with low recurrence rates (Hippokratia 2012;16:280, Case Rep Surg 2012;2012:280982).